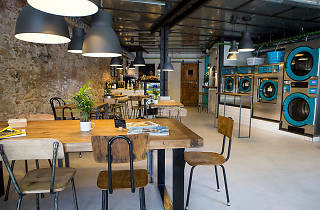 A laundromat that's also a neighbourhood café and bar. You'll never again have to feel lonely watching your laundry spin. If you've ever had to wash your clothes in publich washers and dryers, you'll know the boredom of waiting for the cycles to finish. 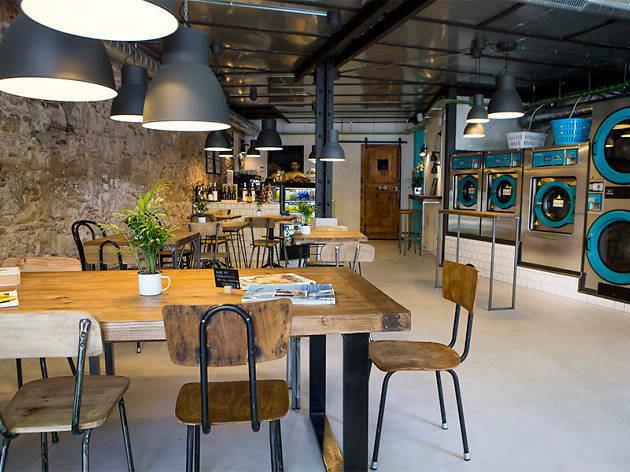 But if you require the use of a laundromat in Barcelona, you're in luck: in June 2018, Marta Pérez and Gerard Navas opened LaBar, a spot that's half laundromat and half café/bar. Please take a moment to appreciate the name, as it just looks like a translation of 'The Bar', is actually a combination of the words 'Laundry' and 'Bar, and when spoken sounds like the pronunciation of 'lavar', the Spanish verb for 'to wash'. Applause. You're under no obligation to eat or drink anything while you're using the machines, but if you do, you'll find you're in a bright and welcoming space – which in previous incarnations was a dairy and a furniture store – where you can connect to WiFi and relax with an excellent coffee from El Magnífico (where Pérez and Navas were trained by baristas). Coffee with quality milk, for less than €2; one wash and one tumble in the dryer for under €7 (with a well-poured €1 draught beer to be the most cost-efficient). A bonus for many older people who don't normally dare to use laundromats on their own is they'll be comfortable here, where there are always friendly staff on hand. LaBar feels like a modern neighbourhood bar where you can get fair-trade soft drinks, good coffee, vermouth, craft beer, and natural wines by the glass, and something to eat from a short but carefully crafted menu that includes hummus, guacamole and home-made cakes, and sandwiches made with Folgueroles coca bread. And all this turns one of your dull weekly chores into an enjoyable couple of hours out.